The 10 Best Bike Shops in Kentucky! The best way to get around town on a beautiful day is on a bike. Whether you just enjoy a leisurely ride or you’re a thrill-seeking mountain biker, there’s a bike shop in Kentucky to cater to your needs. Find all of the rides, equipment, and services you’ll need for an excellent adventure at the 10 best bike shops in the state. Voted the best bike shop in Lexington and central Kentucky, Pedal Power Bike Shop is bike central. If you need expert advice to select and fit a new bike, service or repair on your existing one, or want a great place to rent a bike, this is the place. Open every day except Sunday, Pedal Power has the answers to your questions. Their experienced and friendly staff includes folks who love being outdoors and encouraging others to find their type of bike so they can get out and enjoy it, too. Want to learn more about maintaining your bike? They have workshops where you can learn about making brake adjustments, chain repair, and how to properly clean your bike. Bikeworld in Paducah, Kentucky, is the largest bike shop in the area. Recipient of numerous awards for customer service and very community minded, Bikeworld has raised over $50,000 for local non-profit organizations and been the sponsor or organizer of every Western Kentucky bike event for more than 25 years. You don’t get that recognition without being the best. Their money back guarantee is another reason they have customers that come back again and again and spread the word. No matter what type of bike you want, they have it or can get it for you, and they carry well-known brands like Bontrager, CycleOps, and more. Open every day except Sunday. Are you looking for a trusted resource for the best in bicycles, parts, and related equipment and supplies, including brands like Giant, KHS, FOCUS, and Transition? Middletown Cycling & Fitness located in Louisville, Kentucky, has been providing these services and more since 2012. With a large inventory and helpful staff, you’ll walk away with a smile and everything you need for your next riding adventure. Committed to quality customer service and to supporting the community, Middletown Cycling & Fitness is a proud supporter of Kosair Charities’ Pedal power program to give bikes to kids in the downtown area. Open every day. Just a stone’s throw from the Ohio state line, Reser Bycycle Outfitters in Newport, Kentucky, knows that having the right bike and the right accessories makes all the difference in making a bike event go from good to great. Always ready to help, their satisfaction guarantee and 30-day return policy are just two reasons that keep people coming back. They’ll even help with financing to get you riding as soon as possible, and you can always find brands you trust in stock. Utilizing a Body Geometry Fit Specialist to help you find and purchase a bike that fits your body, your style, and the type of riding you want to do is one of the unique features you’ll find at Bikes & Moore in Hopkinsville, Kentucky. 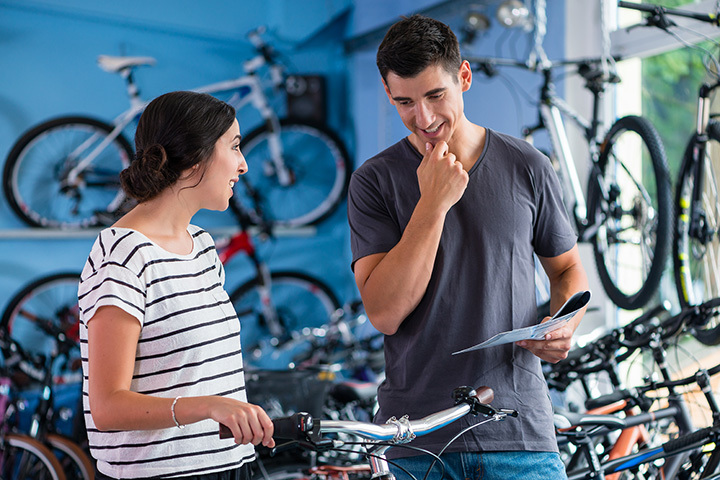 In addition to helping you with your new bike needs, you can rely on quick and courteous service, and a 10 percent discount on all accessories purchased within two weeks after you purchase a new bike. Open five days a week, they’re closed on Sunday and Monday so you can get out and ride! Mike Hale, owner of Mike’s Hike & Bike in Richmond, Kentucky, takes his job seriously. Dedicated to meeting your bike and hike needs, his goal is to provide the best service and products in the area. He understands that you have to rely on the gear and equipment that you purchase with your bike to ride safely and comfortably, so he only carries brands that meet his strict guidelines. The store features a product of the month and may be something from Bianchi, Garmin, and more. You can bring your bike in for repairs and service, and there are group rides scheduled throughout the year for all skill levels. Velocity means more than speed at Velocity Bike & Bean. Located in Florence, Kentucky, this unique little coffee and bike shop always has something going on. Velocity is the coming together of two great interests—coffee and biking. Both can be enjoyed individually or with others, and there’s a win-win situation when you combine them. With a reputation as an expert in both coffee and all things related to bikes, owner and master technician, Mark Ball and the team at Velocity Bike & Bean sell new, used, and consignment bikes. Road bikes, mountain bikes, fitness and hybrid bikes, electric bikes, and urban bikes. With so many bikes from which to choose, how do you know which one is right for you? The staff at Trek Bicycle Store in Fort Wright, Kentucky, know that it’s big step to finding this out and they’ll walk you through the process by helping you determine where and how you want to ride, your skill level, and other factors that will influence the bike you choose. You can check out bike brands in store like Trek and Haro, clothing and fitness items from Primal Wear, and accessories from Bontrager. Open every day, they offer parts and services, price guarantees, 12-month financing, and free shipping on orders over $50. Down to earth service and a smile is what you’ll get at E’Town Schwinn Cyclery in Elizabethtown, Kentucky. No matter what type of bike you like or what kind of cycling needs you have, stop by this great little shop for knowledgeable and friendly help finding what you need. Dedicated to customer service and satisfaction, stop by any day but Sunday and see what they have in stock. First open in 2009, Parkside Bikes has become known as a trusted source for all things related to bicycles. Looking for a new ride this year? Then stop by and talk to Ben or Jef any day except Sunday and Monday when they’re probably out riding. He’ll be glad to help you find the right bike for the type of activity you want. An exclusive dealer for Bianchi, Parkside Bikes also has a good selection of rental road, mountain, and lifestyle bikes. Ryan Day 4: getting my bike fixed at park side bikes.